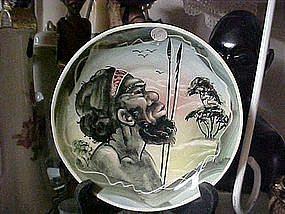 This is an awesome handpainted piece of pottery. It measures 7 1/4" diameter,and is signed on the back by the artist. I have included a photo of the signature though I cannot make it out. It is Australian, I believe. It depicts the profile of a warriers face, spears, and distant trees which appears to be the outback.There is crazing in the glaze. No damages, chips, or cracks. Such a wonderful item! Not sure of the age. I have personally had it 15+ years, and aquired it at a tag sale. 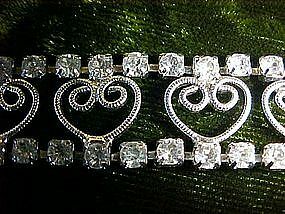 Pretty silver tone bracelet with repeating heart filligree in the center, with an upper and lower band of white rhinestones. Excellent condition. Bracelet measures 6 1/2" closed. All stones intact with a good tight clasp. What a sweetheart of a bracelet. These are the 7 3/4" salad/ dessert/or luncheon plates. They match Gibson Roseland pattern. 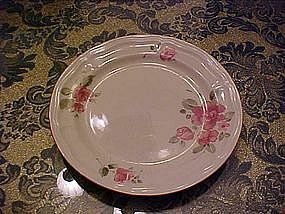 They are handpainted and similar to the Franciscan desert rose pattern dishes. These are dishwasher and microwave safe. I have 4 available. All are in perfect condition with no damages. Price is for each plate. Ask if looking for other pieces in this pattern. These are the nice big dinner plates measuring about 10". The are of the Gibson roseland pattern. hand painted, but dishwasher and microwave safe. They are very similar to Franciscan desert rose. 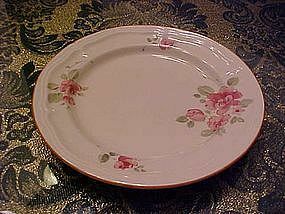 I have 12 of these plates in stock and all are in great condition with no damages or repairs. Price is for each. 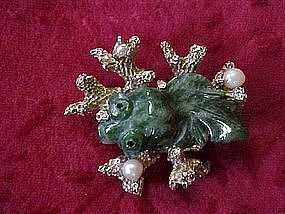 This lovely Swoboda pin has a carved jade fish as the central design. I believe it is a coy or a beta. Swobota is a California jewelry manufactured from the 50s. They were known for their use of semi precious stones and fine gold plated cast settings. It was the "jewelry of the stars". Gold plated setting with 3 cultured pearls. Measures only 1 3/4" long. Marked Swoboda. Nice tight pin back with safety catch An unusually lovely pin.Email for more photos. 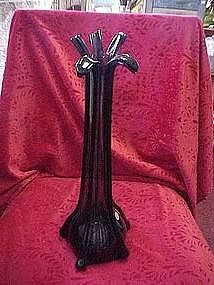 This nice vase has the most rich purple coloring. Made in Italy foil sticker. Measures a generous 14 1/4" tall. Has a very interesting flared top. Perfect condition!! Photo does not show the rich amethyst coloring well. Nice costume pin. 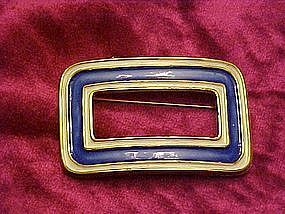 Goldtone with blue and white enamel decoration. Buckle style. Marked Capri. Has a nice tight pinback with saftey closure. Measures 1 1/4" x 2 1/8". Good condition. Wow!! These are a real kick!! 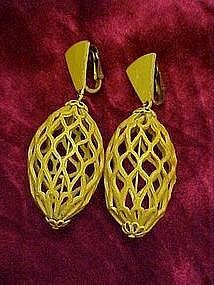 Metal filigree earrings in a birdcage style straight from the Sensational sixties!! Clip ons (could easily be converted to pierced. Measures 2 1/2" long. Far Out!! 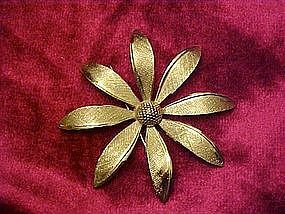 Pretty, simple, yet elegant little silver flower pin. Appears to be a daisy. Signed Giovanni. Nice tight pin back with a safety closure. Measures almost 2" in diameter. Flower power!! 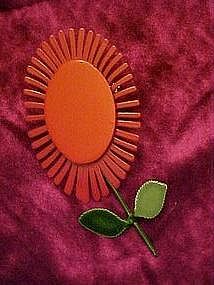 Pretty red enamel painted metal pin. large size measures almost 4" long. No name. Good pin back with a safety closure. 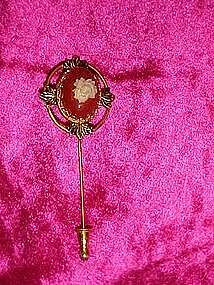 A pretty costume jewelry stick pin. Gold tone with an antique patina on the filligree part. Set in a cameo fashion. A creme color rose set in the brown stone. Looked like a real miniature rose inside the stone. Length is 2 3/4" over all. Decorative part measures 1 x 1 1/4". Pristine condition. Nice 3" button of the space shuttle launch. 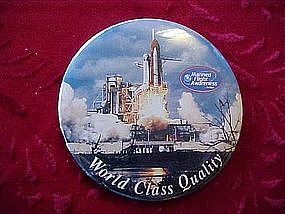 "World Class Quality" Manned flight awareness Nasa. Not sure of the year. Exceptionally nice condition. 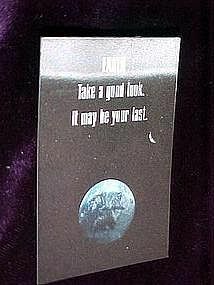 This pin back button is a hologram type made for the release of the movie Independence day/ Has a picture of the Earth and states "Earth take a look. It may be your last. Measures 2 x 3. On the back it notes Limited edition collector pin 1996 Twentieth Century Fox. Excellent condition. A nice 10 1/4" collector plate by artist Susie Morton. Issued by R.J. Ernst & Hamilton collection. 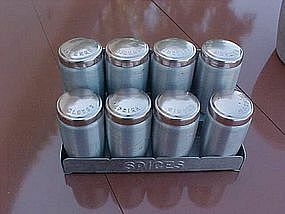 Perfect conditiion, comes in original box with certificate of authenticity. Limited edition, hand numbered, real gold on border trim. 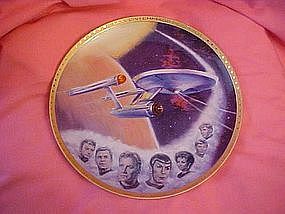 This Star Trek plate was issued in 1984 by R.J. Ernst & Hamilton collection. 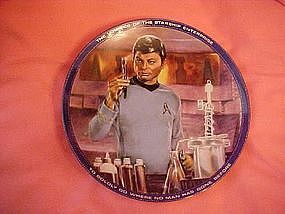 This one is Dr. McCoy, medical officer. It was a limited edition, measures 8 1/2" in diameter,is in pristine condition and comes in original box with certificate of authenticity. I have others to this series listed in my catalog. 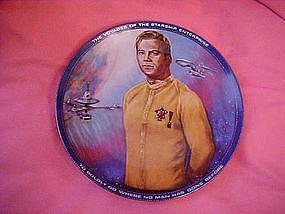 From R.J. Ernst & The Hamilton collection this is the Star Trek, Scotty collector plate. A limited edition by artist Susie Morton. Hand numbered,and comes in the original box with certificate of authenticity. Perfect condition. 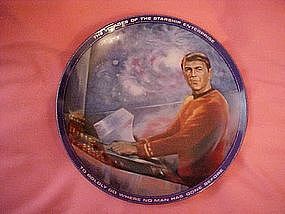 Greatly sought after plate from this star trek series. Made by R.J. Ernst & the Hamilton collection. This hand numbered, limited edition plate is by artist Susie Morton from 1985. Plate is 8 1/2" in diameter ind in pristine condition. Comes in the original box with certificate of authenticity. I have others in this series listed also.